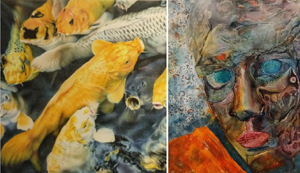 Art Du Jour is a co-op gallery exhibiting works by many Southern Oregon artists in watercolor, oil, acrylic, pastel, pen and ink, collage, sculpture, bronze casting, mixed media, photography, pottery and jewelry. Giclée prints and cards are also available. 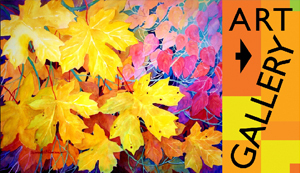 Meet our artists during Medford’s Third Friday Art Walk while you listen to soothing music and enjoy a glass of wine. 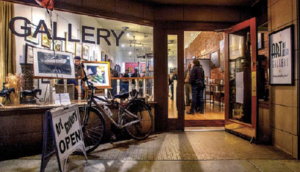 Treat yourself to this fine art experience in the heart of historic downtown Medford. Artists’ Workshop was formed to advance the skills of artists of all levels. We meet each MONDAY morning to grow and experience the camaraderie of a group of artists. 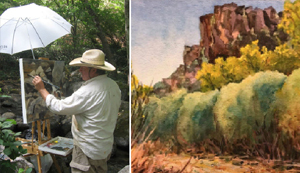 We paint at stimulating locations en plein air in good weather months and meet at Rogue Gallery to paint from live models during the winter. We review paintings and exchange ideas during an informal sack lunchtime. 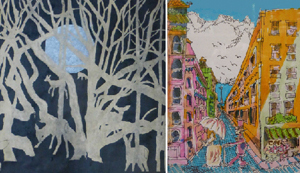 We welcome new members and look forward to sharing the inspiration of making and showing art together. Join us! Featuring Harriet Greene’s unique hand-rubbed, marble stonecut prints and sculptures, five books including her memoirs and her latest novel, Crossing the Boundary, A Return to the Wilderness and Freedom; and Marty Goldman’s award-winning photography, illustrations, modern-day rodeo-art, cartoon book, Don’t Worry and newly published memoir, Mad Ave to Hollywood. The Grants Pass Museum of Art is the city’s primary resource for exhibitions and collections of fine art since 1979. Located in the heart of the historic old town, our galleries offer opportunities for learning, introspection, and connection with cultures from around the world. The Museum’s mission is to enrich lives by offering art experiences that stimulate the senses, intrigue the intellect and bring joy to the spirit. Project Space is the educational art studio and pop-up gallery of representational painter Sarah F Burns. 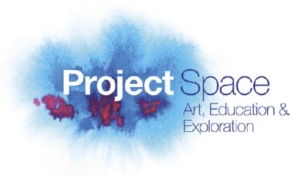 Throughout the year Project Space hosts art classes, events and exhibitions and are a vital part of Talent’s vibrant and expanding art scene. The Southern Oregon Guild’s co-op Gallery & Art Center displays a full range of art and fine crafts— painting, sculpture, photography, art glass, pottery, fiber arts, and jewelry. It also holds a large collection of cards and unique literary works. The Center also produces creative arts events each year. It is located on the RCC Kerby Campus in the Illinois Valley.